NASA’s Voyager 2 probe, launched in 1977, is now more than 11 billion miles from Earth and has reached interstellar space, the agency said Monday. This is the second time a human-made object has reached this part of space. And it’s an incredible feat for a spacecraft designed to last five years. Voyager 2 is now NASA’s longest-running mission, with 41 years under its belt. This boundary is where hot solar wind meets cold interstellar space, and it’s called the heliopause. Mission scientists compared data from instruments on Voyager 2 to determine that the actual date of the crossing was November 5, when the solar wind particles around the probe dipped greatly, meaning it left the heliosphere. “There is still a lot to learn about the region of interstellar space immediately beyond the heliopause,” Voyager project scientist Ed Stone said in a statement. 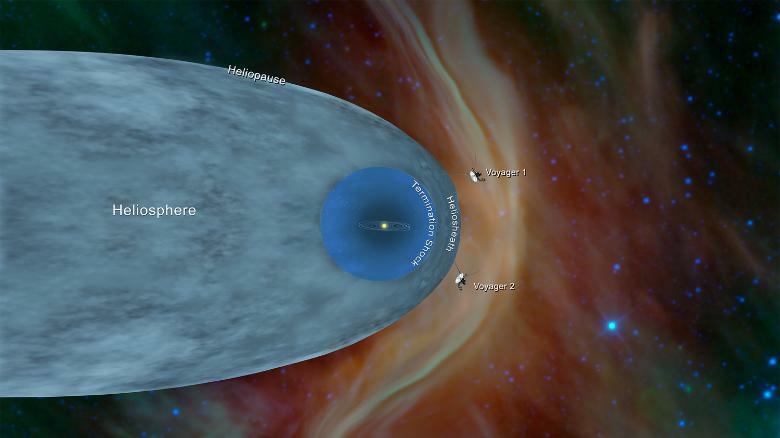 Voyager 1, launched just a few weeks after Voyager 2, crossed the same boundary in 2012 and exited the heliosphere, a bubble of magnetic fields and particles created by the sun. However, just because the probes have left the heliosphere doesn’t mean they have left our solar system. Its boundary is the outermost edge of the Oort Cloud, a group of small objects influenced by the gravity of our sun. The mission scientists believe that it would take Voyager 2,300 years to reach the inner edge of the cloud and 30,000 years to fly past it completely.